As Skirt Week fun rolls on, I thought this was worth sharing. Often kids tutorial writers default to “grab a skirt that fits your kid and trace it” or “go measure your kid’s waist”. But if you’re sewing for someone else’s kid, that’s not so helpful. If I’m making something in a size where one of my own kids won’t work, I go to a standardized chart. It’s funny to call them that, since there is a bit of variation, but for skirts I like this one that I found at Children’s Place. I appreciate that it helps you figure out where you want your skirt to fall. 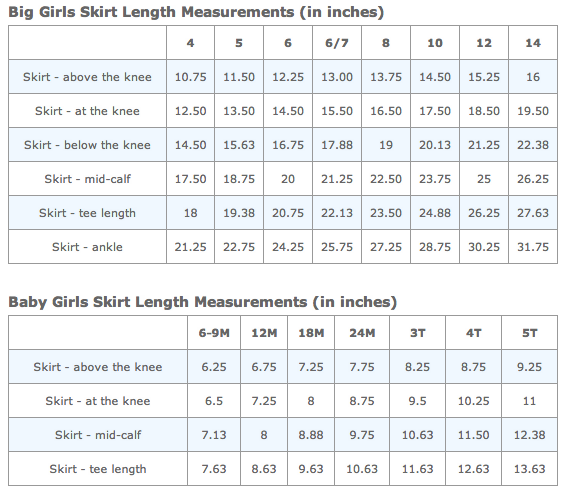 I’m almost always aiming for just above the knee, but if I’m looking to break out of my above the knee rut – at, mid-calf, tee* length, and ankle measurements for skirt length are included. That’s it. Back to the weekend. If you’re sewing for Skirt Week, can’t wait to see! *I think they might’ve meant “tea” length. Thanks for sharing this. I’m always amused at the variation in the “standardized” size charts! And Tee length! That’s classic! This is a very nice chart to have handy. Thank you for sharing it! oh wow well done! That’s very helpful!!! This is also good to know if the little ones are sleeping. . . . :) Thanks for sharing! Thanks for sharing– this will be super useful. Also, FYI: it’s “tea” length, as in “appropriate to wear to tea”. Thank you for this chart! I often want to make skirts for my nieces, but without their measurements, it is hard. Thank you, thank you, thank you! This is so helpful! That’s a great chart! Thanks for sharing :)! This is wonderful, but does anyone know of a similar chart that gives wasit measurements as well…I have found a TON of charts that give sizes based on weight, but that isn’t terribly helpful when you are creating something! Try that same chart on the Children’s Place website that’s linked in the post. There are waist measurements for each size. This was extremely helpful. I have a question, do you know where I can find measurements for children from the waist to the neck or lower? I want to make a dress, but I don’t want the dress to be at the neck, I want it lower; however, I had no idea how to gauge it for other sizes. hope that makes sense.